The TLG is pleased to announce the release of the Online Liddell-Scott Jones, the premier lexicon for ancient Greek. All lemmata and word forms in the TLG corpus are now linked to a new dictionary page that contains links to LSJ. The lexicon is open to the public. Read more about this completed five-year project here. Access the Online Liddell-Scott Jones lexicon here. Le Nouveau Testament à l’heure des papyrus égyptiens - Claire Clivaz. Claire Clivaz - Jean Zumstein (eds. ), in collaboration with Jenny Read-Heimerdinger and Julie Paik, Reading New Testament Papyri in Context - Lire les papyrus du Nouveau Testament dans leur contexte. Actes du colloque des 22-24 octobre 2009 à l'Université de Lausanne. BETL 242. Louvain: Peeters, forthcoming. Clivaz also freely offers her own chapter, "The New Testament at the Time of the Egyptian Papyri. Reflections Based on P12, P75 and P126 (P. Amh. 3b, P. Bod. XIV-XV and PSI 1497)" here. Today begins the 2011 Greer-Heard Point-Counterpoint Forum at New Orleans Baptist Theological Seminar. This year's forum is on the topic, "Can we trust the Bible on the historical Jesus?" featuring main speakers Bart D. Ehrman and Craig A. Evans, and four other speakers: Jennifer Wright Knust, Dale B. Martin, Charles Quarles and Ben Witherington III. In light of recent studies that demonstrate how users/readers of texts were much more typically the ones who introduced changes to the texts, rather than the copyists who generally aimed to copy their exemplar with fidelity, Larry Hurtado proposes that text-critics drop the term “scribe.” In this way, Hurtado urges for less emphasis on “scribes” and “scribal purposes/changes/tendencies”, and more allowance for the role of readers/users. Do you agree with Hurtado's proposal to drop the term "scribe" and simply use "copyist"? Answer the poll in the right sidebar. Update: Results of the poll: Yes 18 (33%); No 29 (53%); I don't know 7 (12%). Total votes 54. A few days ago, one of our regular readers, Brice Jones, went to the Beinecke library at Yale to examine P49 (P.CtYBR inv. 415) and P50 (P.CtYBR inv. 1543). Brice focused especially on the latter, containing Acts 8:26-32 and 10:26-31. Read his report here. Further, Brice reports here on his work to transcribe another MS, a Fayumic Coptic MS of the Gospel of John, P. Mich. 3521, for the International Greek New Testament Project (IGNTP). During this examination, Brice has identified some errors in the editio princeps: Elinor M. Husselman, The Gospel of John in Fayumic Coptic (P. Mich. INV. 3521) (KMA 2; Ann Arbor: University of Michigan, 1962). A student who examines physical manuscripts and scrutinizes manuscript editions? I suspect we have a budding TC scholar here. Now I wonder where he will write his PhD – I have heard he has had several offers. The Reliability of the New Testament: Bart Ehrman and Daniel Wallace in Dialogue, ed. Robert B. Stewart (Minneapolis: Fortress Press, 2011). For a brief discussion of Martin Heide's paper, “Assessing the Stability of the Transmitted Texts of the New Testament and the Shepherd of Hermas”, (pp. 111-145) see Larry Hurtado's Blog. 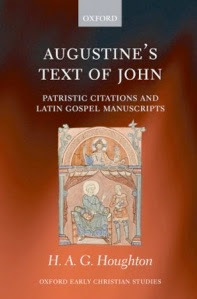 Today there are over 180 extant Coptic MSS of the Gospel of John in the Sahidic Coptic dialect, as reported by Karlheinz Schüssler in his overview, “Some Pecularities of the Coptic (Sahidic) Translations of the Gospel of John,” Journal of Coptic Studies 10 (2008): 41-62. Most of these MSS are fragmentary, but there are five complete MSS of John (i.e., sa 505, 506, 508, 561, 600), thirty-eight lectionaries, and three other liturgical MSS. Schüssler has published facsmile editions and transcriptions of sa 505 and sa 506 online on his website Biblica Coptica. Both MSS are from the Monastery of Apa Jeremias (Saqqara) dated to around 600 C.E. These editions contain images facing transcriptions presented in a convenient e-book format. Karlheinz Schüssler is editor of Journal of Coptic Studies, and Biblia Coptica, a series which lists all the Coptic biblical mss. He is currently working on a text of John in Sahidic for the International Greek New Testament Project. More on Schüssler's personal webpage. For Coptic resources on-line, see here (Coptica) and here (compiled by co-blogger Askeland). Fortress Press, 2001. Cloth. English. Now available in an updated second edition, this classic will prove an indispensable addition to the scholar's library. Emanuel Tov offers extensive descriptions of the major witnesses to the text of the Hebrew Bible, the Hebrew texts from Qumran, the Septuagint, the Masoretic Text, the Aramaic Targumin, the Syriac translations, the Vulgate, and others. Society of Biblical Literature -SBL, 2009. Paper. English. Simor, Ltd., 1997. Cloth. English. Don't forget to also check out Tov's online publications. Jim West has composed the biblical studies carnival of January here bringing together "the best posts from as many biblioblogs as possible."